First let me start by saying that this is a very large humidifier, and I was a little off put by that when I first opened the box. But it was super easy to put together and has worked like a charm since I got it. Winter has hit and everything dries up horribly where I live. So getting this was a blessing in disguise. 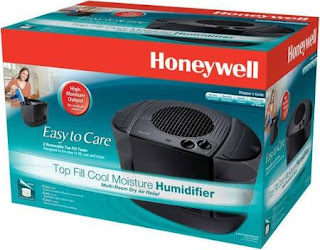 I have had other humidifiers in the past and some were great and others weren't, but I would have to say that this is one of my favorites! One: It is sorta loud, not crazy obnoxious, but not super quiet either. Two: You need a few accessories to make this work efficiently and stay clean. Three: You will need a pretty nice size end table to hold it, again it is pretty large. All in all...I actually really like this product. And for those of us who are beauty people, humidifiers are your friends. No frizzy hair, no dried out skin! Extra things you should pick up with this are extra filters, a Honeywell Humidity Meter, & Protec Humidifer Cleaning Balls. They work wonders!!! !